They tapped into the spirit of No Wave, utilized odd instruments such as the hippo tube and the foghorn, and did covers of World War II Italian partisan songs. So yes, it's safe to say that based on their style and approach, The Dog Faced Hermans bid bye-bye to any shot at mainstream success early into their career. Jazz, folk, funk, punk, post-punk –- you name the genre, The Dog Faced Hermans wove a thread of it into their music. However, the group made forays into the world of No Wave more than anything else. They also bought into that movement's ethos during their shows, approaching gigs with a this-is-performance-art-as-much-as-its-music attitude. 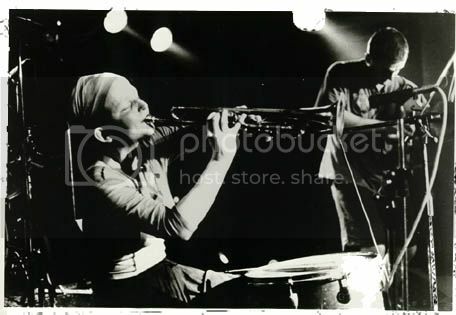 For example, vocalist Marion Coutts (now an artist) was known for her distinctive on-stage poses and gestures, trumpet gripped firmly in hand. The band's fifth album, Hum Of Life, conjures up the atonal ghosts of Lizzy Mercier Descloux's "Wawa," Teenage Jesus And The Jerks' "The Closet," and The Contortions' "Designed To Kill." The dissonant yet danceable rhythms, the gusts of horn, the abrasive guitar parts -- it's all there. Hear it for yourself. Download: "How We Connect" by The Dog Faced Hermans. Coutts' lyrics were once described as being "emotional but never sentimental" and it was never more evident here. "I hover, you stutter/We miss, and crash," she laments. "The mystery lies in the space between us." Dance Chapter has secured a spot in the annals of pop music history, but not on account of any material they produced. According to stories, Ivo Watts-Russell -- the founder of the label Dance Chapter was signed to, 4AD -- had just wrapped up a particularly arduous recording session with the band. As Watts-Russell made the trek from Cambridge's Spaceward Studios back to London, he popped in a demo tape from a Scottish outfit named Cocteau Twins. Almost immediately, the label head was taken by Robin Guthrie's glistening guitar parts. Watts-Russell invited the Grangemouth trio (Guthrie, vocalist Elizabeth Fraser, and pre-Lowlife bassist Will Heggie) down to London's Blackwing studio to cut a single. But after hearing the results, the tracks "Speak No Evil" and "Perhaps Some Other Aeon," Watts-Russell came to the conclusion that a single just wouldn't suffice. No, not with a band featuring Fraser's prodigious vocal talents. (After hearing Cocteau Twins' second album, Treasure, a music critic would describe Fraser as possessing "the voice of God.") 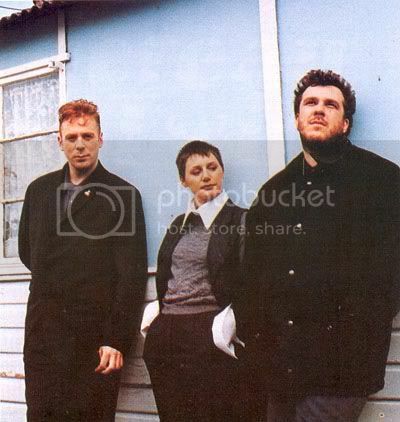 Cocteau Twins were then brought back to the studio to record a debut LP. The most interesting part of this story? The amount of time that passed from the day the band mailed their demo tape to the day they began recording an album was just nine days. And certainly that's a testament to the group's inimitable sound, even though it was still in its embryonic stages. Before he partnered with gal pal Clare Ward to form the seminal Sarah Records, Matt Haynes authored a popular fanzine entitled, Are You Scared To Get Happy? The zine's stellar prose was described as being evocative, yet ethereal, as Haynes often tackled the hot-button issues of the day (such as the growing commercialism within the U.K. indie scene) with beautifully written aplomb. Remember Fun, a band Haynes was quite familiar with, took the same approach: mix the sweet with the scathing. During the late 1980s, the Glasgow-based band became known for their lovely, shimmering guitar pop and the way it contrasted nicely with their biting, socially charged lyrics. The group's first single came about thanks to Haynes, who released it on his pre-Sarah Sha-la-la label. According to Haynes, the goal was to be "anti the status quo," so all releases on Sha-la-la were of the seven-inch, flexi disc variety, with each record featuring two different bands. Remember Fun's "Hey Hey Hate" was released in 1987, with Emily’s "The Old Stone Bridge" on the flip side. Two more song releases then followed: "Clearly Blurred" on an Airspace charity LP later that year; then "Cold Inside" on Egg Records' A Lighthouse In The Desert compilation, which was released in November of 1989. In 2001, Matinee Recordings stepped up and re-issued some of Remember Fun's catalog. The four-song Trains Journey EP can be purchased here. The music calls to mind contemporaries such as The Close Lobsters, as well as latter-day Scottish groups like The Trash Can Sinatras. Hear it for yourself. Download: "Clearly Blurred" by Remember Fun. By 1990, Creation Records was leading a double life. Still churning out the guitar music that had become the backbone of its catalogue, the label was now dabbling in acid house as well. The releases from this year show the dichotomy: the landmark, indie-meets-dance "Loaded" by Primal Scream, which hit record shops in February of that year; EPs from shoegazer standouts My Bloody Valentine and Ride, which both arrived in April. For months, Alan McGee had dug just the E part of rave culture; now he had finally become keen on the dance component. Naturally, his burgeoning fascination with this scene carried over to his record label. According to David Cavanaugh's My Magpie Eyes Are Hungry For The Prize, there were initial plans to create a spin-off label to release any and all dance-related music. But that was shelved on account of McGee wanting to maintain Creation's all-encompassing status: how the label could issue a single by an artist as esoteric as Momus, then follow that up with a release by a one-off hoot such as Baby Amphetamine. Sheer Taft, a good chum of Primal Scream's, joined other similar-sounding acts such as Fluke and Sound Of Shoom in getting the Creation treatment. 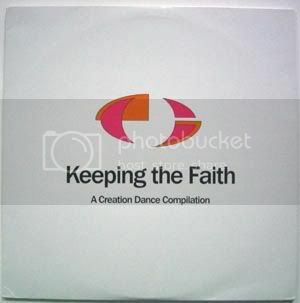 The track highlighted here was featured on one of the label's dance compilations, Keeping The Faith. Hear it for yourself. Download: "Cascades" by Sheer Taft.